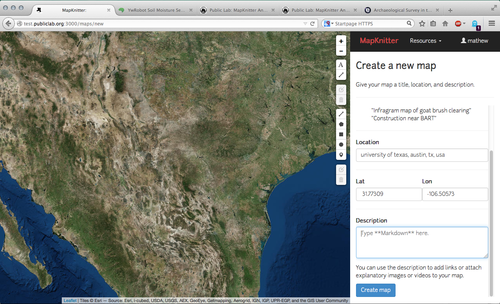 The first pre-beta of the new MapKnitter interface is live! Try it out at test.publiclab.org:3000. Please do note that this is an early release and that the following features, among others, have not yet been implemented. In addition, only those pages which are essential to creating and viewing new maps have been refactored using the new interface. I am working to add rich annotation functionality to MapKnitter as part of Google Summer of Code (read about my project here: http://publiclab.org/notes/justinmanley/03-18-2014/mapknitter-annotations-using-fabric-js-gsoc-2014-proposal). The goal of this research note is to provide an update to the community on my progress with refactoring the MapKnitter interface. Integrated @xvidun's file upload interface (based on jQuery-File-Upload). 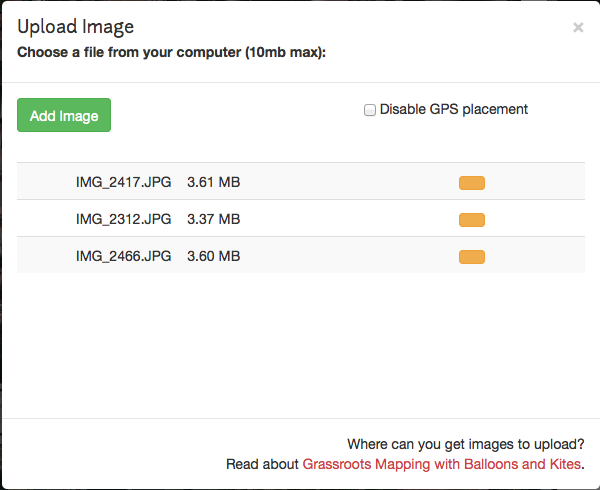 Enabled Leaflet.Illustrate and Leaflet.Draw in map viewing mode. 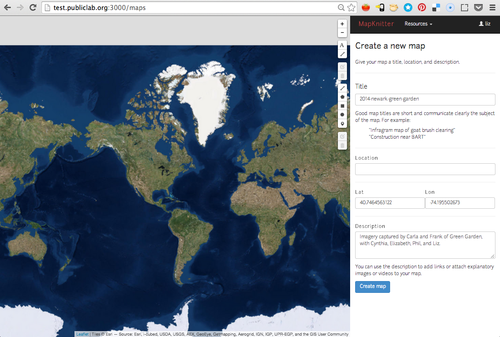 Enabled warpable drag-and-drop from the sidebar onto the map. I haven't yet been able to integrate @xvidun's autoplacement features yet because those depend on Cartagen (@xvidun's autoplacement code calls new_image and new_image_GPS from Cartagen). Unfortunately, the Element.hide() method in Cartagen breaks Bootstrap dropdown menus (presumably because it conflicts with jQuery's hide() method, so it doesn't seem to be a sustainable in the long-term. 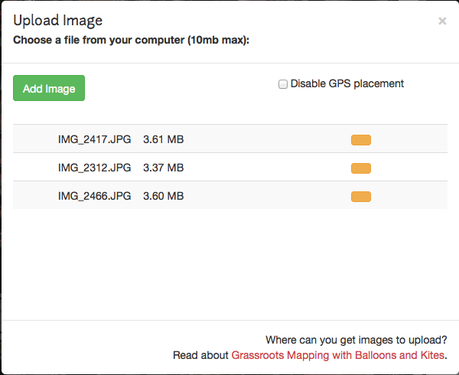 Defining toGeoJSON for Leaflet.Illustrate annotations, deciding how Leaflet.Illustrate and Leaflet.draw objects will be stored in the MapKnitter database, and writing migrations and a new ActiveRecord model to handle them. Adding to the Leaflet.Illustrate user interface to allow people to pick different colors, fonts, etc. for their annotations. I also really want to work on integrating Anish's ImageDistortLeaflet plugin into MapKnitter, since the ability to distort images placed on the map is absolutely the core functionality of MapKnitter. This will be my primary focus as soon as I've spent some time working on annotations. any way to go back to place search through Google Maps API when creating a map? currently ou really need lat lon to start a map. I couldn't change the location of the map after saving the wrong coordinates--- map recenters to the wrong place, even when I enter new ones and hit save. 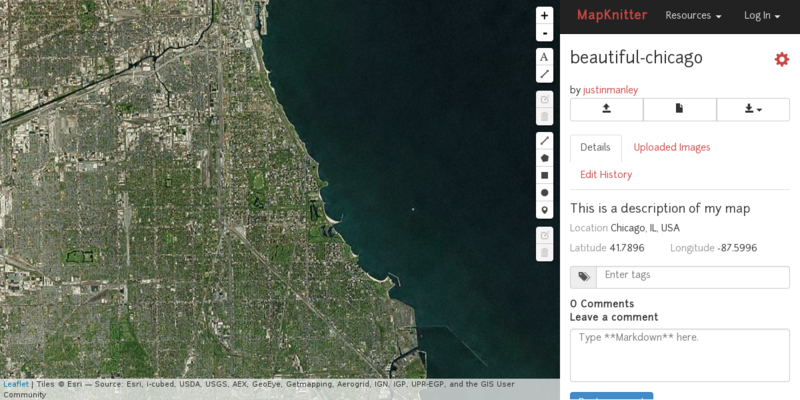 I accidentally hit the 'delete' key and my map became toast-- at least in my edit window. I went back to the home screen. It was gone. Made a new one. could start at a lower zoom level where most mapknitter maps start. any way to have a re-center the map around starting location button? if I scrolll around I can lose my place and its hard to get back. (if i hit 'enter') in the lat/lon box I get re-centered, so the feature is there. 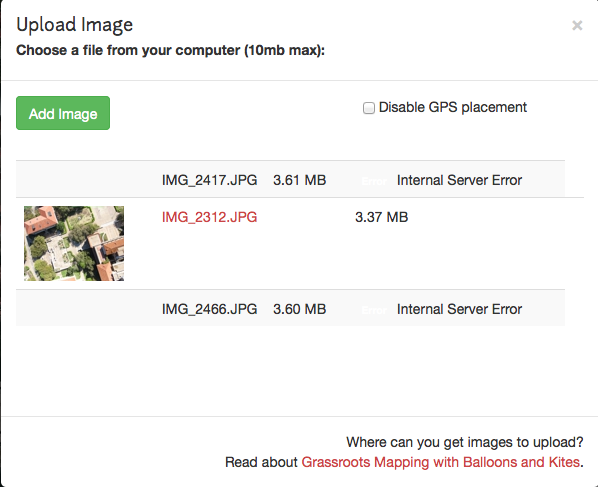 upload doesn't have description of what buttons do, no upload in progress message, uploads failed 2/3 of the time. I can't figure out how to place images at all. no "close" function on a line is confusing-- can't click the first point to turn it into a polygon. pointer needs a new logo. I love the feature though. There is no way to tie text to either the map scale or the pointer. We need both. no way to change the color of annotations. 'edit' and 'trashcan' appear twice in my screen, can't find a functional difference. 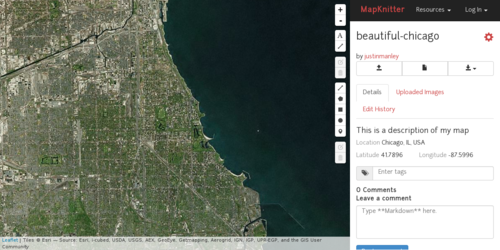 Annotations are not saved-- they disappear when I leave a map. Hi all - thanks for the feedback. I have added most of the bugs your reported to my todo list on GitHub. I'm working hard on integrating annotations right now, so it may be a few days before I can get to anything on that list - but I'll get there eventually. @liz - I want to push back against what you said about map titles. In the long term, I would love to see MapKnitter use more human-friendly map titles (i.e. "My First Map of Utah" instead of "2014-03-05-my-first-map-of-utah"). Most of the information in the title format you described above is already stored in the MapKnitter database (i.e. date_created timestamp, detailed and general location) - so if we encourage people to write human-readable titles, MapKnitter could generate map slugs in the format you recommend. What is the rationale behind the format you described? Is it to make maps more easily searchable? interesting @justinmanley . I often make maps of the same site over time, and I like the titles to be crystal clear. Sometimes i search by date and placename. Sometimes i am looking for all maps that are in a larger geography, like, for instance all maps in New Jersey, and so it helps if that is captured in a searchable field as well. Date is critical, and the date the images are taken is rarely the same as the date the map was made. People commonly cause themselves future problems with inaccurate/lazy naming. In terms of visible vs infrared imagery, perhaps we add a checkbox for this? I am interested in what you are saying about having basic information that stored in the database be more visible. Ahh. I see what you mean about the date the images were taken being different from the date the map was made. I think that for the time being, it will be best to stick with the format you described above (I already have more than enough on my plate) - but I think that nice-looking map titles should go on the list of long-term nice-to-have features for MapKnitter. 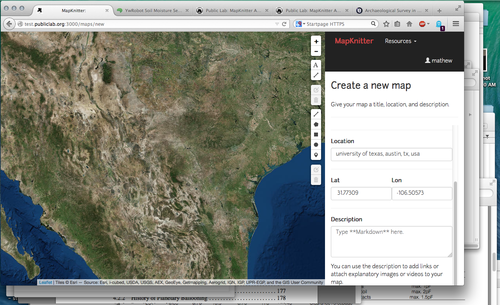 Making these nice-looking map titles work in the long-run won't just involve a format change. In order for MapKnitter to be useful, this change will need to come along with a transition to a "supermap" default viewing mode, as well as a built-in interface for searching maps by location and time, as we've discussed in my "Interface Refactoring" research note. Re: visible / infrared imagery - yes, I'll add a checkbox. hey @justinmanley , thanks for making mapknitter so much more awesome! These ideas are really cool. Everyone's looking forward to them.